Mezzanine (Multi-Level) Storage Systems can be an effective way to utilize all the available vertical space in your building. However, even if you don’t need one now, a little evaluation, planning, and a small expense up front, can save you time & money in the future. First, we will discuss the most common type of mezzanine support structure used for small parts storage: a Shelving Supported Mezzanine. Then, in our next post, we will examine how to effectively plan for a mezzanine in the future. Shelving supported mezzanines use standard steel shelving or bulk storage racking to support the second level. The rack or shelving can stop at the deck height to provide a clear, open second floor, often called a ‘deck-over’ system, or continue up through the floor level, to provide storage units on the second level, mirroring the layout on the first floor (see photo below). In the latter case, only the aisles will have the floor decking. 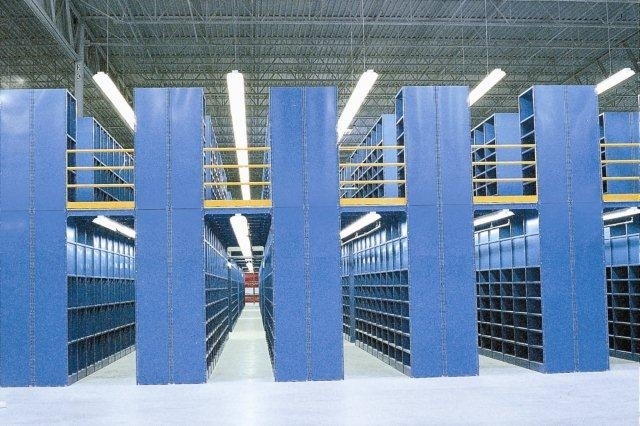 Recommended sway bracing and shelf spacing are required in the units on the lower level for strength and stability; therefore the lower level is always used for parts or smaller carton storage. Railings will be required on the mezzanine, around stairways, open areas and at the ends of aisles on the upper level. Why would you want to think about a mezzanine before you need one? The answer (as it often is in the business world) is Money! Installing a mezzanine in an existing facility with on-going manufacturing, order picking and storage operations is time consuming, possibly dangerous, and definitely more costly. So, if you are planning for a mezzanine in the future, there are a few easy and low cost steps you can take now to minimize the extra costs and impact to your operations in the future. Check our next posting for everything you need to know, before you start building on the ground floor! This entry was posted in Mezzanine, Small Parts Storage, Storage Efficiency and tagged mezzanine, parts, space, storage. Bookmark the permalink. Planning ahead can save you great expense. This looks good. When is the Part II going to be available?